To solve regional problems, we must think like a region. 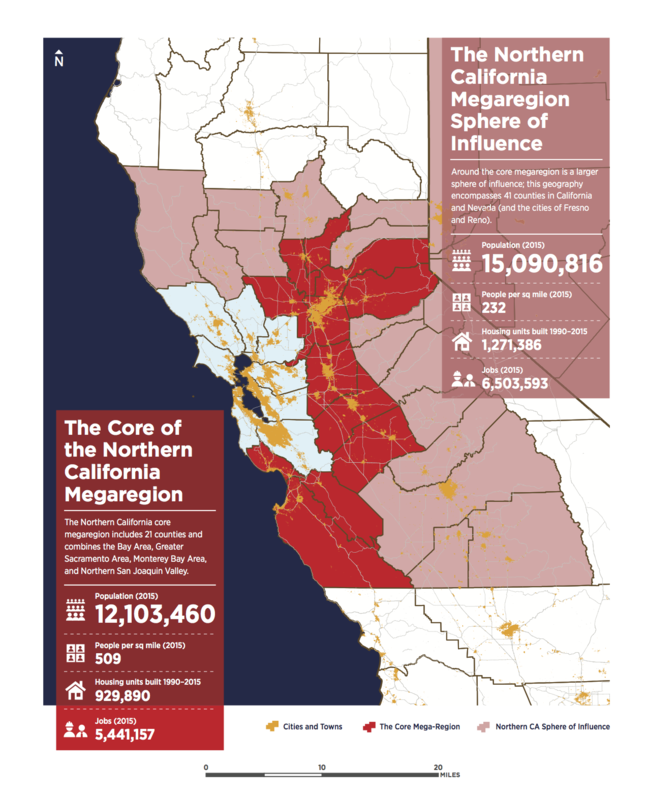 SPUR is pleased to announce the launch of a major new project: the development of a regional strategy for the Bay Area. We aim to paint an aspirational picture of a better future, develop strategies to get us there — and inspire others to join us. We live in an amazing place — in uncertain times. The San Francisco Bay Area is one of the world’s most dynamic, innovative, cosmopolitan and progressive urban regions. Its cultural openness, economic opportunity and extraordinary quality of life have drawn people and companies from all over the world. 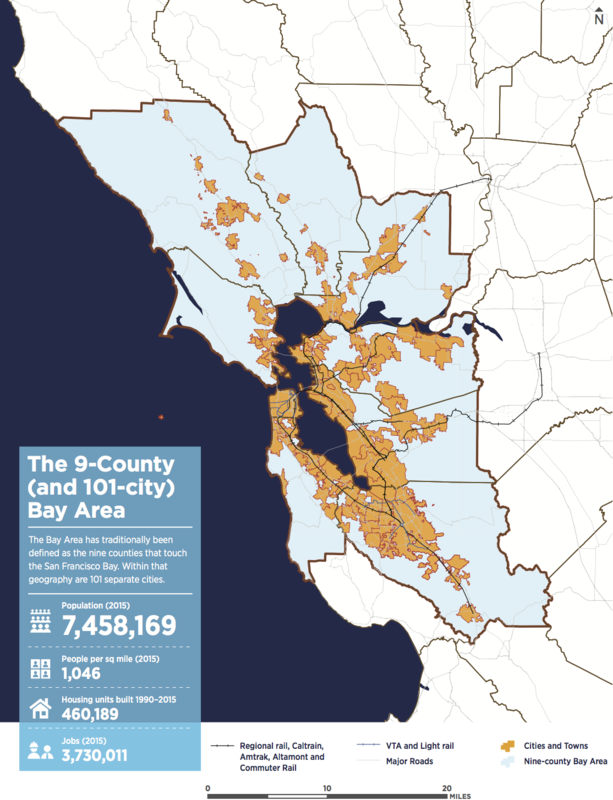 In spite of its wealth and economic dynamism, however, the Bay Area faces serious problems. It has become one of the world’s most expensive places to live. Though the region’s economy has been growing explosively since the 1970s, housing production has not kept pace. The accumulated shortfall, decades in the making, has driven prices up and pushed the less fortunate into an economic vise, forcing them to choose either grinding commutes that separate families or moving out of the region entirely. Tent cities have spread across our communities in a jarring affront to our sense of decency. Many people feel a growing sense of insecurity and loss. Transportation. Air quality. Housing. Jobs. Sea level rise. Most of these seemingly intractable problems are regional in scale, unaffected by administrative boundaries. Yet most of our tools and powers are found at the local and state levels. The regional agencies we do have — BART, the Bay Conservation and Development Commission (BCDC) and Metropolitan Transportation Commission (MTC), for example — tend to be limited in purpose and power. Land use regulations (the rules that determine how and where growth happens) are the purview of 101 separate local municipalities just in the nine counties that touch the Bay. We face a stark choice. We can succumb to fatalism and allow today’s troubling dynamics to play out indefinitely, or we can get to work. The Bay Area will be here after the next boom and the next bust. If we’re lucky, it will continue to prosper and draw new people for decades, generations, even centuries. If we thrive, we will grow, and we must learn to manage that growth in a spirit of openness, innovation and stewardship. Our problems are not inevitable, and we can invent new ways to solve them. How can we accommodate continued population growth so that we can finally turn the corner on housing costs? What will it really take to make this region more affordable? How can we remain a diverse and inclusive region? How do we ensure that everyone benefits from a growing economy? How will rapid technological change further transform industries and jobs within our region? How do we best support economic resilience in the face of future transformations? What kind of transportation system do we want, and how will we pay for it? What should transit operators do in the face of the massive change sweeping the transportation sector? How do we make sure cities handle the advent of autonomous vehicles better than they handled the introduction of automobiles a century ago? What do we need to do to eliminate greenhouse gas emissions from our region so we can make it a model of a sustainable metropolis? What needs to change so that we become capable of adapting to climate change? What kind of governance capacities do we need in order to successfully meet these challenges? Previous generations have accomplished great things here when civic voices have come forward with new ideas. They built the Golden Gate and other bridges, constructed the BART system, saved the Bay and preserved the Presidio and the Marin Headlands. In hindsight, these achievements might seem inevitable, but they were anything but. They were the result of sustained effort and hard work by thousands of people against daunting odds. What will this generation’s legacy be? In the current political climate, it can feel as if the era of ambitious collective action has passed. With years of diminishing federal investment giving way to an outright assault on many of the programs and protections we value most, it is left to us to shape a future we can believe in. We know that people will move here, whether or not we want them to and whether or not we are prepared to accommodate them. We know that to handle newcomers without sprawling outward or displacing residents, we need to build denser, more compact neighborhoods, which fortunately are also healthier, more sustainable and more economically valuable. But often it can feel as though new housing is only for the very wealthy or for a few lucky recipients of subsidized units. And the region’s newer communities rarely seem designed around community, families and human interaction — the very things that great urban neighborhoods do best. To make the case for urban life, we need to build communities that are available to ordinary people and put human needs — both practical and intangible — at the center. And while we want to get over our dependence on cars, we have failed to provide a real alternative. The expansion of our public transit systems has been glacially slow and exorbitantly expensive and has failed to touch the lives of most residents. From BART to high-speed rail and beyond, we need to invest in world-class 21st-century transit. But data, ride hailing, shuttles, autonomous vehicles and congestion pricing will all shape our transportation future — for better or worse. With profound technological changes on the horizon, we need to establish a new framework with the public interest at its heart. We must also avoid neglecting another core asset: great neighborhoods that are safe and comfortable for people of all ages and offer much of what we need on foot. 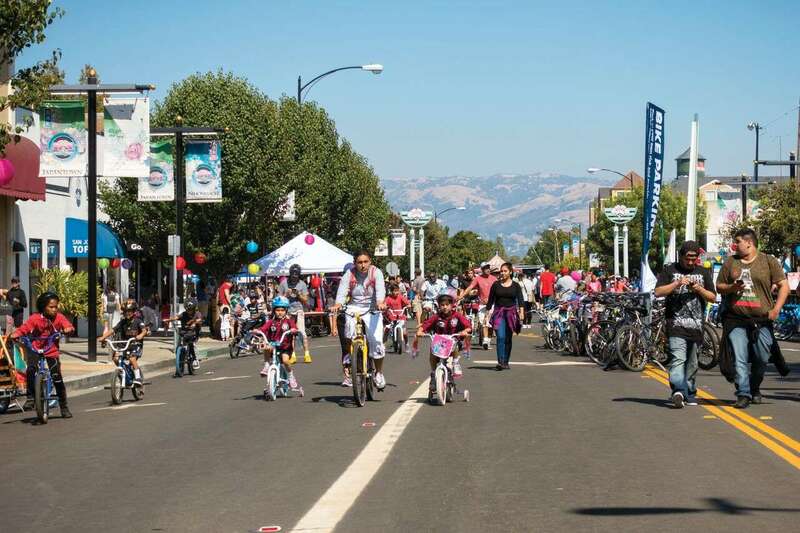 The Bay Area’s communities are interdependent: We’re all in this together. To solve regional problems, we must think like a region, imagine a better region and act as a region in the service of our common future. To get there, we will need to reaffirm our shared values of inclusion, openness, sustainability and innovation; to ask ourselves what a Bay Area that embodies those values would look like decades from now; and to create an aspirational vision backed by a road map of policies, actions and investments that can actually get us there. Imagining scenarios that describe some of the very different trajectories the region might follow over the next three decades, and their implications for our shared future. Assembling and building analytical tools to help us understand the Bay Area as it is and how it’s changing. This will result in a set of “place types” that describe the most common environments. Creating policy toolkits for a wide range of places so that each can play a part in building a better future, and testing the aggregate effects of policies on the region as a whole. Convening top practitioners around our most challenging issues, from sea level rise to housing costs, and publishing briefing papers and blog posts on emerging ideas. Reaching out to community members to understand and affirm our shared values and where they come into tension. Taking a hard look at our governance structures and considering whether they are sufficient for today’s challenges and those on the horizon. A project of this scale will push us to look beyond our usual geographies, networks and comfort zones. SPUR’s strategic expansion into the region’s three largest cities, along with our longstanding engagement in regional planning, makes us uniquely prepared to move forward. Along the way, we will engage SPUR members and the public to solicit ideas, share information and stimulate a conversation about the region’s future. Our existing public engagement programs — more than 200 talks, panels and tours annually — will be pressed into the service of this conversation. In addition, SPUR staff and board members will undertake the largest outreach campaign in our history, conducting over a thousand conversations with Bay Area residents, policy makers, activists, civic leaders and others. As it has done for over a century, SPUR will work to turn ideas into action; to build consensus around the major initiatives that will make the vision real; and to stay with the big ideas — often for decades — through shifting political winds. In crystallizing a generational-scale agenda for the Bay Area, the Regional Strategy will become our road map for advocacy over many years. Traditional conceptions of our region define it as the nine counties that touch the Bay. But these boundaries don't reflect many of the important factors that shape our lives, including development patterns, housing markets, the transportation network and the economy. 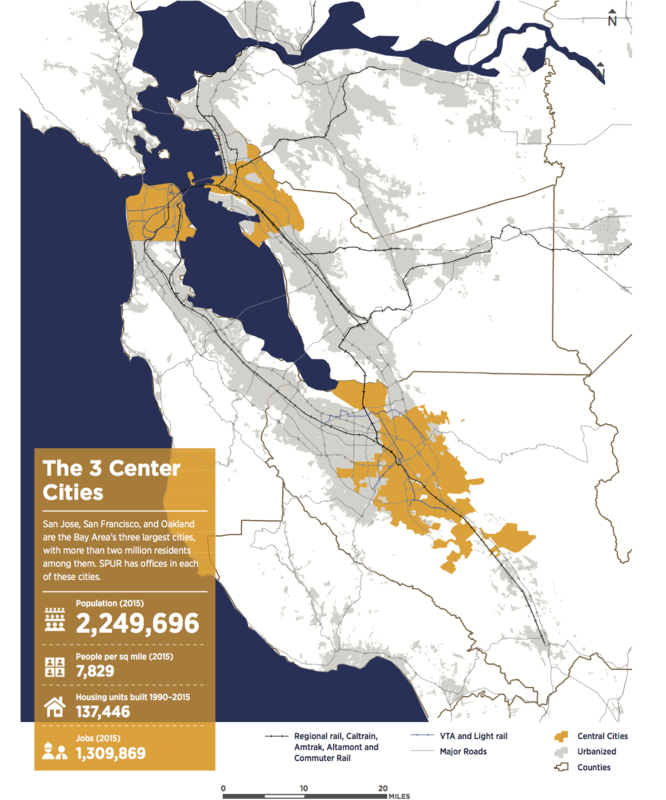 The following maps offer four different scales for considering the geography and influence of the Bay Area. Benjamin Grant is SPUR's urban design policy director.